Bees, like humans, have a very complex social structure, and beekeepers should understand this structure if they are to be successful. Honey bees are vegetarian and get their proteins from the pollen they eat. Honey bees also get carbohydrates from the honey that is made from nectar. As social insects, the honey bees work together in harmony for their colony to survive. The honey bees are divided into three different types which are the: the queen, the drone and the worker bee. The queen is a female bee that is fertile, and whose main purpose is to mate with the drone bees (males), in order to reproduce and to bring about new bees. In the unfortunate event that a queen bee dies, the worker bees will select a number of young worker larvae and feed them a special kind of diet referred to as the royal jelly. The worker larvae that have been fed the royal jelly will then develop into a young queen. There is only one queen bee in a colony. Drones are the male bees that mate with the queen bees. In a colony there can be several drones at a time. Worker bees are female bees that are infertile because they were not fed the royal jelly from they were a larvae, and so the development of queen morphology did not take place.The worker bees generally do all the work of the colony such pollen collection, nectar collection, water collection etc. The worker bees also make up the largest population of a given colony. 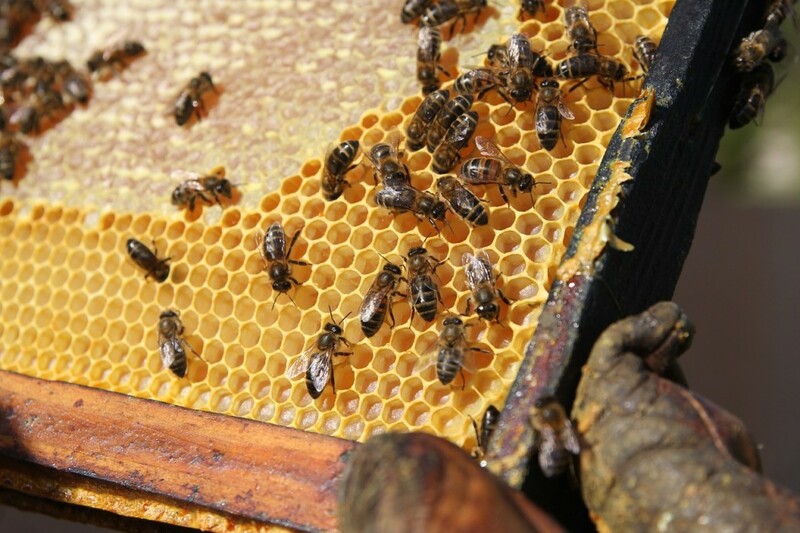 The hive body – is a large wooden box that holds up to 10 frames of the comb, it is also referred to as the super. It is here that space is usually left for the bees to rear their brood and also keep their honey just for their use. The bottom board – this is the wooden stand where the hive rests. It can be placed on a rock to so that it is elevated above the ground. Frames and foundation – these are the wooden frames that hold the sheets of wax usually bearing hexagonal shaped cells. To build straight combs bees use the frames and foundation. Queen excluder – is usually placed between the honey supers and brood nest. It is the part that keeps the queen in the brood nest, this helps to prevent any possibility of brood occurring in the honey supers. Honey supers –this is where the bees store their surplus honey which is harvested. The inner cover – the inner cover ensures that bees do not attach the comb to the outer cover and also offers insulation to dead airspace. The outer cover – this simply offers protection from harsh weather. The bee hive boxes houses the frames in which the bees make their honeycombs, making them a very important part of the bee hive kit. Usually the boxes are designed to offer bees the shelter, enough space to raise their brood, and enough space to store honey. Bee hive boxes should be raised above the ground to ensure that the bees are safe from predators such as ants or rodents that feed on bees and honey. The best way that you could raise your beehive boxes is by suspending them from strings fastened to posts or trees. When the boxes are raised above ground chances of surface runoff water interfering with the bees during heavy downpour is reduced. The beehive boxes also need to be well ventilated to allow the bees have enough oxygen that they need to survive. Traditionally, wood has been the basic material that people have used to make beekeeping equipment. Over the years though as technology has advanced, manufacturers are offering different synthetic variants. Some of the synthetic materials that are used these days include plastic, polystyrene etc. However, it is best to use wood because bees tend to accept wood more than the synthetic materials. The bottom part of the hive that forms the base should be made from a hard and thick wood, because it is the part that supports much of the weight. Mostly the bottom board is made from cypress wood but it is better to go for the screened bottom board instead of the standard bottom board because it offers good ventilation. It is the deep hive body that contains frames of honeycombs. High quality deep hive body is usually made from cypress of clear pine. They are joined by way of dovetail joints for more strength. A beekeeper may need two deep-hive bodies which he will stack against each other. The bees will use the lower deep hive body as their brood chamber where hundreds of young bees are raised. The upper deep hive body they will use as their food chamber and this is the place where they store most of the honey or pollen for their use. It is best to go for cypress wood for the outer cover of your beehive because it a very good rot resistant and also last longer. On the top of the outer cover you could opt for a galvanized steel tray that will fit well. Alternatively there are also plastic top covers that you can go for which will not rot easily, but the tops covers made of cypress wood still remain the best available option. Bee hive ventilation is important as it has been established that it actually helps to determine the size of the honey yield that the bees produce. Ventilation of the box are also important because it allows the bees to regulate the temperature of the hive. Bee hive ventilation is also important because it ensures that during the extremely cold winter months, condensed moisture will not drop onto the bees in the hive. By venting the hive, you alleviate any possibility of moisture build up, moisture that will turn to water with condensation caused by the extreme cold outside. Basically the cold itself will not kill the bees but when the hive gets wet due to condensed moisture, the bees will die. During the winter season bees usually cluster together and avoid going out of the hive because of the extreme weather. Having good, free air flow for the bees is also beneficial to their health as it ensures that there will be no possibility of suffocation. Keeping the walls of the bee hive cooler than the ceiling helps in trapping the moisture, thus condensing it before it reaches the ceiling. This is the best way to ensure that the bees inside will not get frozen by the extreme condensed moisture dripping from the ceiling.